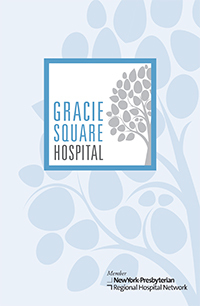 Gracie Square Hospital offers a multidisciplinary approach to care for patients with psychiatric disorders who can benefit from inpatient hospitalization. Our diagnostic and treatment programs are provided by skilled behavioral healthcare and management teams for a wide range of psychiatric illnesses and disorders. Our dedicated teams include licensed and certified staff members who create a nurturing, therapeutic environment where patients are encouraged to ask questions and gain a better understanding about their illnesses and treatment. Our goal is to help patients return to their communities to live healthy, productive lives. Our mission is to provide the highest-quality, state-of-the-art mental health and chemical dependency treatment in a warm, healing environment. Our caring, compassionate team prepares our patients to return to their families and communities and engage in productive and fulfilling lives. We serve the diverse residents of the greater New York metropolitan area through treatment, education and health promotion. Respect Treating every person in our care with dignity and respect.